Amine Hachicha, A.; Rodriguez, I.; Oliva, A. 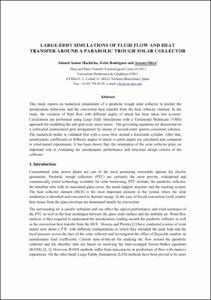 This study reports on numerical simulations of a parabolic trough solar collector to predict the aerodynamic behaviour and the convection heat transfer from the heat collector element. In the study, the variation of fluid flow with different angles of attack has been taken into account. Calculations are performed using Large Eddy Simulations with a Variational Multiscale (VMS)approach for modelling the sub-grid scale stress tensor. The governing equations are discretised on a collocated unstructured grid arrangement by means of second-order spectro-consistent schemes. The numerical model is validated first with a cross flow around a horizontal cylinder. After that,aerodynamic coefficients at different angles of attack or pitch angles are calculated and compared to wind-tunnel experiments. It has been shown that, the orientation of the solar collector plays an important role in evaluating the aerodynamic performance and structural design criteria of the collector. Amine Hachicha, A.; Rodriguez, I.; Oliva, A. Large-eddy simulations of fluid flow and heat transfer around a parabolic trough solar collector. A: International Conference on Solar Heating, Cooling and Buildings. "Solar energy for a brighter future: book of proceedings: EuroSun 2012". Rijeka: 2012, p. 1-8.